New Delhi, 30 June, 2017: Offering true portability and durability, Elanpro, India’s leading commercial refrigeration company, has launched a Portable Ice Maker with distinctive features like single water tap and optional online plumbing. Since these ice makers are portable, just put water into the machine and ice is produced in just a few minutes! Elanpro Portable Ice Machine is part of the affordable, hi - tech ELANPRO ICE MACHINE Series (EIM) that combines productivity, reliability and ease-of-use with aesthetic appeal and quieter operation. The product is equipped with intelligent water use design. ELANPRO ICE MACHINE SERIES is equipped with new water management design that offers foodservice operators a low cost of ownership and superior performance even in the most challenging water conditions. The product uses both tap and bottled water. The technologically advanced machines reduces scale build up and the associated costs of scale mitigation, all while remaining very water efficient. The plates are made of stainless steel enhancing the durability. The Ice Machine also comes with automatic timer function, full and deficient water alarm that enables to leave the ice maker unattended, with the confidence. Elanpro Portable Ice Machine is aimed at meeting the on-demand ice needs of small Juice parlors, Bars, Restaurants, Luxurious residential apartments, sports bar, gym, spa, sports injury and trauma Centre etc. A user friendly product, Elanpro Portable Ice Machine delivers high levels of reliability and energy efficiency. Just with a mere press of few well labelled buttons, one can enjoy the first batch of ice produce within fifteen minutes only. The product is capable of producing upto 15 kgs of ice everyday. 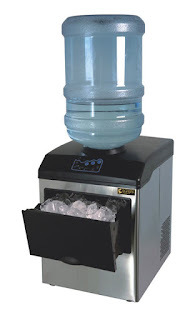 Elanpro Portable Ice Machine is designed to dispense all three sizes of ice. Compact size (measures 17L x 14W x 18H Inches) plus lightweight design makes it super easy portable machine. The product uses technology to simplify everything about the ice making process. With a new team of experienced sales and technical personnel, Elanpro will also handle sales, installation, preventive maintenance and emergency repair services. Priced at Rs. 28000, ELANPRO PORTABLE ICE MACHINE is now available at Elanpro dealer stores. Elanpro is an organization focusing on commercial refrigeration & food-service products in India. An organization trusted by the largest names in Hospitality, Retail and Pharma Industry, the company has a network of almost 200 channel partners in Key districts of India. The company represents the world’s leading brands for Beverage Dispensing: Vin Service’s for BEVERAGE RETAIL segment – includes Beer and Soda Dispensing System from Vin Service Italy. With the aim of creating a difference with its service in the industry, the company has created trusted relationship with major Retailers like Pepsi, Coke, Amul, Sabmiller, Inbev to have trusted Elanpro.